Heidi has nearly 20 years of experience in wealth management as a fiduciary specialist. 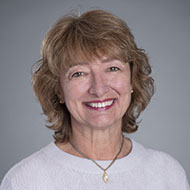 She has completed the American Bankers Association’s Certified Trust and Financial Advisor (CTFA) program for advisors who demonstrate expertise in the wealth and trust field, and the Series 7 licensing exam. Treat your client like you would like to be treated and always have their best interest in mind. Every time a client thanks me for what I do for them.